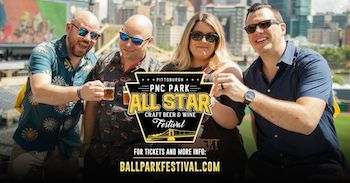 Get (2) General Admission (SESSION 2 (7-11PM)) tickets to the All Star Craft Beer, Wine and Cocktail Festival on Saturday, June 29th at PNC Park for the price of one! 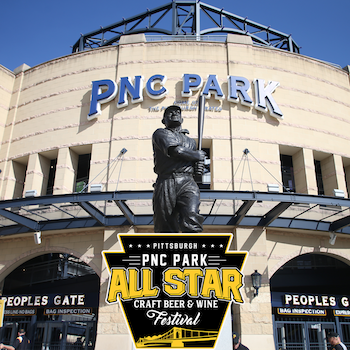 Includes access to hundreds of craft beers, wines and spirits for session 2 (7-11pm), a commemorative sampling glass, ability to walk the warning track + visit the dugouts (weather dependent), 2 Pirate's tickets, great entertainment, vendors, games, giveaways, and more. 2. 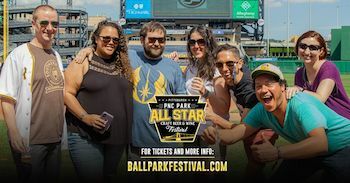 Visit http://allstarpittsburgh.upcomingevents.com/justpayhalf/ and select 2 General Admission tickets. *Make sure you choose the correct session for the deal you purchased, codes will not work otherwise. Valid for (2) General Admission Tickets for Session 2. SESSION 2 - General Admission Includes access to hundreds of craft beers, wines and spirits for session 2 (7-11pm), a commemorative sampling glass, ability to walk the warning track + visit the dugouts (weather dependent), 2 Pirate's tickets, great entertainment, vendors, games, giveaways, and more.